So, when the football fans are cherishing another unlikely triumph in Chennai City’s I-League title win, the days of hard work, planning, strategising and implementing should not go unnoticed. Chennai City deservedly clinched the I-League after beating Minerva Punjab 3-1 at home on Saturday. After conceding in the third minute and trailing the whole of the first half, Chennai City came with a different approach in the next half as they scored three goals to dash East Bengal’s hopes. 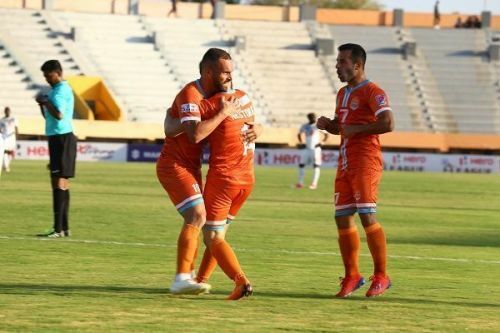 In the previous two years, Aizawl FC and Minerva Punjab made headlines when they won the title, beating bigwigs such as East Bengal, Mohun Bagan and others. Chennai City have repeated the tradition with this time too. No one anticipated that Chennai City, a club which had finished eighth last season, would win the league. But there lies the mystery. Proper planning, hard work and the hunger of win can lead you to success. Nestor Gordillo, Pedro Manzi and Sandro Rodriguez have never played together. Though Pedro and Sandro had spent two years at Spanish lower division side Ibarra, they got little time to play together. Nestor, on the other hand, was playing in the north of Spain, in Cornella at Catalonia. Apart from Pedro, who is Uruguayan in origin, the other two players belong from the Canary Island, a place off the coast of Africa. Yet, they have formed an impeccable partnership so many miles away in Chennai City. The trio has produced 38 goals among the 47 goals that were scored by Chennai this season. Manzi alone scored 21 goals, being the joint top scorer of the league in the process. Sandro scored nine goals whereas Gordillo scored one less than his partner. Even though Manzi scored 21 goals, the best among this trio is surely Gordillo. For, he has been the wrecker-in-chief in every game. Playing in the left wing, he takes all the load on himself and rips the opposition defence apart with his breath-taking skills. He has great vision and with his excellent speed, he often makes an inside cut and makes a perfect cross to either Manzi or someone else who is in a better position than the Uruguayan. Manzi is lethal within the 18-yard box. Sometimes, he attracts the opposition defenders towards him which allows other players to score. His goal-scoring ability is compared to none and that is well and truly reflected in the four hat-tricks that he has scored. Sandro is well known as the free-kick taker. He has scored at least five goals from set-pieces, including against Mohun Bagan and East Bengal. His corners are even so accurate that it is impossible for a player not to score. It was visible against Minerva Punjab on Saturday when Gourav Bora scored two goals from his crosses.